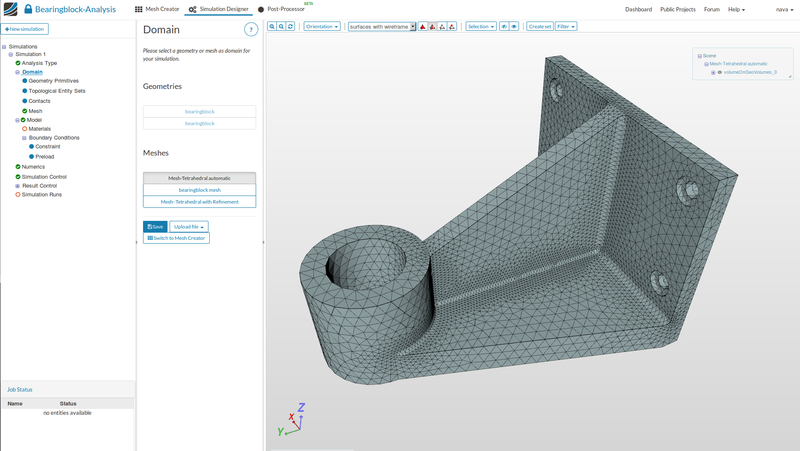 SimScale is a single interface to a various numerical simulation capabilities. A central concept of the SimScale interface organisation are the Simulation types. For running a simulation you first have to define its general type in terms of its basic physics. When using computational mechanics to analyse a physics problem, one or multiple solution fields (e.g. the displacement field of a solid body or the velocity field of a fluid flow) are calculated on a given geometrical domain. In order to use a numerical solution method the geometry has to be discretized (approximation of the continuous geometry by a discrete number of elements/cells). In the model section everything that defines the physics of the simulation is specified. This involves properties of the domain as for example material parameters as well as initial settings and boundary conditions for the simulation. Under Numerics you can set the equation solver for your simulation, change the convergence settings or choose the time integration scheme for transient dynamic simulations. These settings mainly influence the stability and efficiency of your simulation run, but also the quality of the results may depend on these settings. Under the tree item Simulation control you can adjust different global properties and parameters regarding the simulation process. All analysis types on the SimScale platform do have some of these properties in common and some of them appear only in certain analysis types. Here you can also decide on which instance type your simulation is calculated via the number of computing cores setting. Result Control allows users to define extra simulation result outputs. If you are specifically interested in specific solution fields or calculations as for example average values on a certain entity you can adjust the result settings here.